...the bad guys are making a comeback. And once more, Russian president Vladimir Putin is supporting the forces of repression and dictatorship. ...but how about the brave people demonstrating now in Belarus? In what is a thinly-veiled Stalinist police state, they're standing against the recent corrupt elections. Pray for these brave souls as they strive to bring democracy to their country! Now that you’re committed to a lifestyle of servanthood, don’t give up! After saying that “trial, error, and success” are the key elements in finding your own unique brand of servanthood, we identified several important ways of being a servant, based on a list compiled by Richard Foster: serving in hidden ways; doing the service of small things; serving by guarding others’ reputations; allowing oneself to be served by others; and affording courtesy to others. In the coming week, we’ll look at other ways of serving. I hope that this list will do more than respond to any curiosity you feel about what the Bible means when it talks about servanthood. It’s presented in order to spark you (and me) to use trial, error, and success on the way to authentic, pervasive Christian servanthood! The New Testament book of Galatians was written by the apostle Paul to a church that confronted several dangers. One was the danger of believing that one can be saved from sin and death by the good things that a person does. Another danger was the opposite notion that if a Christian sinned, failing to live in an attitude of love toward God and neighbor, it didn’t matter. Both ideas were wrong, Paul said. To his friends in the Galatian church, he wrote, “You foolish Galatians!...Having started with the Spirit, are you now ending with the flesh?” (Galatians 3:1-3). Paul was urging those first-century Christians not to give up. Later, he says, “...let us not grow weary in doing what is right...” (Galatians 6:9). There are only nineteen more days left in our journey to servanthood. Ask God to help you incorporate these lessons in Christian service into your daily life so that even after these forty days, the good things the Holy Spirit is planting in your heart now will keep growing and blooming in a lifestyle of Christian servanthood all your life! Bible Passage to Ponder: “Let us not grow weary in doing right” (Galatians 6:9). "Frankly, the Christian leader I seek is the one that does not appear to want the job." So writes John Schroeder in a fantastic post on what it means to be a leader from the Christian perspective. John--rightly, I think--says that real leadership is built around three traits: humility, self-sacrifice, and obedience. Frankly, the truth John writes smack me in the face because I am so aware of my deficiencies in all three areas. But I think that he's absolutely right on all three counts! Don’t overlook the rendering of common courtesy. I suppose most of us think that we’re mannerly folk. We also think, as British humorist Lynne Truss observes in her book, Talk to the Hand: The Utter Bloody Rudeness of the World Today, or Six Good Reasons to Stay Home and Bolt the Door, that when we are rude, we’re simply having bad days. But when others are rude, we believe that their rudeness displays deep, ongoing flaws in their characters. Common courtesy is far more than a disposable social convention. Good manners are the most common way you and I display love toward our neighbors--even the neighbors in our own homes--and honor God (Matthew 25:31-46). I like Truss’ equation of empathy and courtesy. “In everything, do to others as you would have them do to you,” Jesus says in a passage known as the Golden Rule. Put yourself in the other person’s shoes. Wouldn’t you want to be treated courteously? Bible Passage to Ponder: “In everything do to others as you would have them do to you...” (Matthew 7:12). "The decision of whether or not to stop the genocide in Darfur may be one of the defining moral questions of our time"
So says Father Michael Perry. Overstatement gets thrown about with ease, of course. But what's going on in Darfur is a massive tragedy. It's difficult to overstate how horrible it is. Please, pray and support international action to end the genocide there. A willingness to be served by others can also be an act of servanthood. Let me tell you about a man I once knew. His sudden death, seemingly in the prime of life, came as a shock to everyone. One phrase was used repeatedly to describe him: "He was a nice guy.” I knew that this was true. He was a nice guy. But I knew something else: He had been terribly unhappy. "I'm everybody's doormat," Mr. Nice Guy once said. "I don’t mind doing things for others. But I never seem able to muster the courage to ask anyone else to help me." Often, nice-guyism is at least partially motivated not by love for others and certainly not by a desire to respond to God’s love given to us through Christ, but by a desire to feel important. As a pastor, I’m often given special treatment by other Christians. Because of that, I try to incorporate service into my daily relationships. I don't want to take advantage of other people or risk viewing myself as some sort of privileged person. At a wedding reception one night, I was going to refrain from getting my food, which was being served cafeteria-style, until everybody else had theirs. But as I sat at my seat, the bride’s father approached me. “What would you like to eat, pastor?” he asked. “You don’t have to get my meal,” I told him. A somewhat hurt expression crossed his face. He said, “I know I don’t have to do it. But I want to do it.” It would have been the cruelest act of arrogance on my part not to let that man serve my food to me. Bible Passage to Ponder: “Let her alone; why do you trouble her? She has performed a good service for me...She has done what she could” (Mark 14:6, 8). v. 35: (1) Jesus has just finished predicting His death and resurrection, turning typical triunphalistic expectations of the long-awaited Messiah on their head. Yet, James and John clearly haven't understood Him. As The New Interpreter's Bible points out, in spite of Jesus' previous talk about "discipleship as taking up the cross and of the lowly as heirs of the kingdom, James and John ask for the chief positions of honor when Jesus enters His glory." (2) In Matthew's Gospel, the request made here by James and John, the two sons of Zebedee, is ascribed to their mother. Many commentators suggest that Matthew was trying to deflect responsibility for this play for power and authority from the two disciples. But I've always assumed that if the mother played any role in this affair, she did so with the complicity of the sons. v. 37: (1) The entire request reflects a view of the Messiah as a political figure who would rout the Romans and establish his own reign, a bit like what happened at the time of the Maccabean revolt of 168 BC. Then, God's people, the Judeans, under the leadership of corrupt priest-kings, rid themselves of Greek and Syrian overlordship. Most of the Messianic visions that had currency among God's people were triumphalistic. They envisioned punishing the overlords-du-jour (in first-century Judea, when Jesus lived, died, and rose, it would have been the Romans) and establishing a nationalistic dominion under an heir of ancient King David. (2) The phrasing of James' and John's request reflects how rulers and their top lieutenants were routinely pictured in those days. The second-in-command would be to the king's right. (That's why even today, we speak of some people being the high-and-mighty's "right hand man.") The next person in the pecking order would sit at the top person's left. Ignoring Jesus' call to self-sacrifice and to sharing in His suffering, the Zebedee brothers focus on their desire to be big shots. (A) Cup. Jesus, of course, speaks of His own suffering and death as His cup during His prayer in Gethsemane (Mark 14:36). (B) Baptism. This seems to echo images of overwhelming waters found in some of the lament psalms (check out Psalm 42:8; 69:3). Paul goes on to write of the life of Jesus-Followers as a daily reiteration of this crucifixion/resurrection motif, a lifestyle in which we daily submit to the death of our sinful nature so that our true selves, our God-selves can rise in joy. It means that our sinful self, with all its evil deeds and desires should be drowned through daily repentance; and that day after day a new self, should arise to live with God in righteousness and purity forever. Jesus has more in mind than the death of our old selves when He speaks of the cup and baptism, though. He also means that we risk and may experience actual persecution and death for our faith in Him. He urges all who contemplate following Him to count the cost. Seeing the possibility of persecution must surely be part of that inventory. Of course, this is brave talk from a guy like me, one who likes my comforts and has never really suffered for my faith. 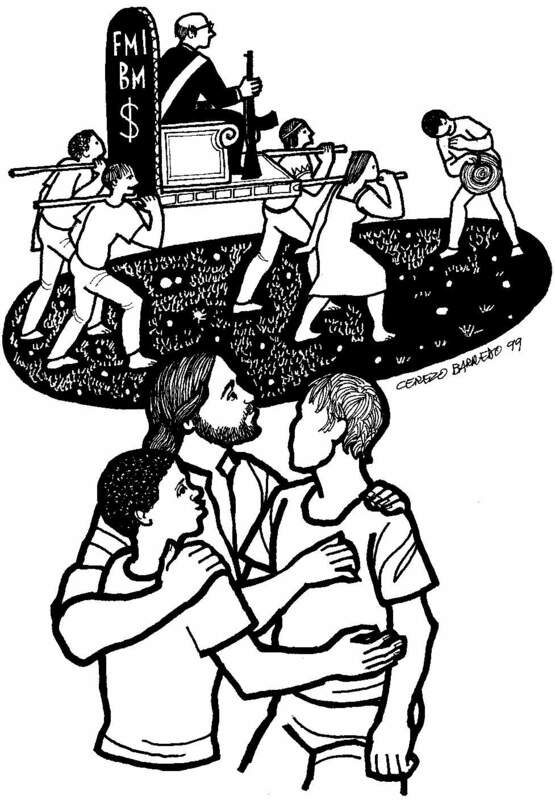 (2) One can't miss the fact that the images Jesus uses here also nicely represent the two sacraments of the Church: Holy Baptism, the entry point into a relationship with Christ and His family, and Holy Communion, the food that Christ sets aside for our common journey with Him. This connection fits in well with this passage's themes of submission, humility, repentance, and renewal. v. 39: (1) The confidence with which James and John answer Jesus' question is almost laughable. It reminds me of the arrogant line I wrote as part of my yearly evaluation process at the end of my first year in seminary: "I have great confidence in my ability to be a pastor." Today, were I to read such a statement by a seminarian, I'd be tempted to drum the student out of the place. Subsequent years have taught me the truth of Jesus' words in John: "Without Me, you can do nothing." And of Paul's words: "I can do all things through Him [Christ] Who strengthens me." (2) Jesus indicates that the brothers will experience drinking His cup and Baptism of suffering and death. Acts 12:2 records the execution of James under orders from Herod Agrippa. "Jesus' prophecy concerning the martyrdom of James and John reminds the reader that the failures of the disciples during Jesus' lifetime are not the final word about their faithfulness as followers of Jesus. Although they will run away during the passion, these same disciples will later share the suffering of Jesus." These sentences remind us not to be too harsh in our judgments about James and John, of course. They're neither exceptionally evil or thick. They're a lot like us...at least, they're a lot like me. But I find that these two sentences also give me hope. When I consider how sinful I am, how often I have deliberately rebelled against God, and how selfishly I have sometimes lived, I take comfort from the patience, forgiveness, and grace that Jesus showed to people like James and John. God doesn't use perfect people in His kingdom. He welcomes imperfect ones and patiently transforms them. God is truly amazing! v. 40: Jesus' statement here appears to parallel what He says in Mark 13:32, where He says that only the Father knows the day when Jesus will return to the world and bring this world's life to an end. v. 41: The other ten are probably as ambitious as James and John, just not so overt or bold. Remember that this gang has already argued over who is the greatest (Mark 9:33-37). v.42: In the community Christ calls into being--the Church--things like power, arrogance, and worry about status are gone. vv. 43-44: (1) Greatness is measured in the willingness to serve. This insistence on service distinguishes Jesus' understanding of the new order from many apocalyptic visions. v. 45: (1) Jesus' death as a "ransom for many" sets His death apart from the deaths of martyrs. As the New Interpreter's Bible points out, we may share in Jesus' suffering, but our lives don't act as sacrifices for others' sins. Why Does Richard Cohen Cry More These Days? Why Do I Cry Less? I cry when I think of people I love, or have loved, and of books I treasured as a young man but would probably not enjoy as much today. My eyelids sting at the sound of certain songs from my youth, and get blurry when I see photos of my wife before I met her. I cry when I think of my children, and, though I don’t let it show, my eyes fill at the sight of them. I weep inwardly at the thought of certain artists who have filled my life – my adopted fathers and mothers, though they don’t know it – who will inevitably die in the next few years. Ray Bradbury and J. D. Salinger, even foolish Norman Mailer though I’m not a fan of his, and Lauren Bacall though I haven’t seen that many of her movies, and Kim Novak, who’ll one day pop up in an obituary and people will shake their heads fondly: “I haven’t thought of her in years!” And a little later, when old age starts hitting the rock stars — when frail, tottering Dylan leaves us in mid-tour and we lose our great national artist, it will be the biggest news all week, and I’ll choke up whenever I hear about it. One nagging question, then: why haven’t I cried for my parents? I find that I cry less than I did when I was younger, although movies and Hallmark commercials can still bring me to tears. I didn't even cry at our daughter's wedding last June. I should explain though, that I had prayerfully steeled myself against tears, fearful that if, as co-presider and preacher, I wept, it would reduce my daughter, my wife, my son, the congregation, my daughter's new father-in-law, and my co-presider, a dear friend and honorary aunt to our daughter, to puddles. Sometimes I wonder if the reason I don't cry so much these days is that I cried so much when I was younger. At the slightest provocation of emotion or sentiment, I would cry. Somehow, I think, I've already grieved a lot about life. Now, I've reached a kind of acceptance of the grief that often accompanies living in an imperfect world. That may be why I don't cry so much. I don't know. As to your not crying for your parents, this is a deep question which I'm sure that none of us can really answer. But I do have a few thoughts. It's said that our families are who we get stuck with by genetics or adoption. But our friends are the family members we choose. We may feel that we have more in common with our friends than we do with our families, more in the way of shared values and goals. That's why those Goth kids in their black shirts, pants, and fingernail polish feel closer to their group than they do to their parents. But there's something else that draws us toward friends as our chosen families, I think. Our friends aren't as familiar with all of our foibles and faults as our parents and siblings. At least, they have less history of being annoyed by them in the family's atmosphere of forced intimacy. It's easiest for us to have "friendships" with authors, film stars, and important people we've never met. From a distance, we may see Dylan cynically playing the media like Garbo in a leather jacket, or hear Baez reveal that Bobby never really cared about causes, or watch the footage of doped-up Dylan trying to intimidate Donovan and be repulsed by it all. But we can choose to ignore those things. We never really have to deal with them. We can create an idealized picture of artists like Bob Dylan and never have to cope with the real people as we must with our families or that our families must with us. We can focus on Dylan the poet, Dylan the deeply sensitive artist, Dylan the fearless performer. We don't have to listen to him clear his sinuses when he wakes up in the morning or put up with him once more railing against pop music after reading yet another fawning review of the newest diva's CD. From a distance, Dylan can be some shimmering ideal who never told us to take out the trash, sit up straight, make sure we've got a handkerchief, and for goodness' sake, put the keys where we found them after we use the car. Kim Novak has never complained that we left the toilet seat up. Not once has Ray Bradbury argued with us about politics. J.D. Salinger hasn't complained that we didn't call him and he's never whined at us. Sometimes, we cry because we grieve. But sometimes we don't cry because we grieve. Perhaps you anticipate crying at the loss of these artists because of the connections you feel with them. And it may be that you haven't cried over your parents because of the connections you never felt to them. Intimacy may have erected walls between you and them that has, in turn, walled off your tear ducts. Once again, wonderful and honest writing, my friend. I hope that no one will be so flippant as to say that I weep less because of my faith in Christ. Or at least not to say it in a particular way. Jesus doesn't insulate us from the reality that loss causes us pain, even when we're sure about how the whole story is going to end. While I do have joy and confidence in the ultimate outcome of my life and the ultimate destiny of the world because of Christ, grief and pain are still real. Go read Richard's blog. He says important things memorably...and movingly, whether you cry or not. UPDATE: This is the last time I cried. The liberal former mayor of New York might have a shot at gaining the nomination of the Republican Party in two years, if the results of yesterday's Republican primary race for the Illinois governorship is any indication. Nominated for governor by the GOP was state treasurer, Judy Baar Topinka. John McCain (the Senate's third most-conservative member) or Mitt Romney (conservative darling from Massachusetts) she ain't. Topinka supports abortion rights and gay civil unions. Like the last two Republican governors, Ryan and Jim Edgar, she is a fiscal conservative and social moderate, though similarities to her buttoned-down predecessors mostly end there, Jackson said. Topinka called her Republican challengers "morons'' during a March 9 dinner event. She later apologized. In her 1995 inaugural speech for the first of three terms as treasurer, Topinka joked about flatulence, alluding to the effects of ham-and-bean campaign dinners in the confines of a small van, according to an account of her remarks by the St. Louis Post-Dispatch. She plays the accordion for audiences and smokes Marlboros in public, bemoaning failed attempts to quit. She pokes fun at her "chemically dependent'' bright red hair. Topinka isn't exactly standard Republican fare. Yet, she passed muster with GOP voters in Illinois. Rudy can take some encouragement from that. He's not nearly as outrageous as Topinka, but their views on social issues appear to be aligned. If Republicans in Illinois went for her, Republicans in Iowa, New Hampshire, and South Carolina might well go for him in the fight for the presidential nomination. It should be said though, that Topinka faces an uphill fight against an incumbent Dem, Rod Blagojevich, who, while not winning his primary battle decisively, enjoys a big lead over Topinka in the polls. This Illinois gubernatorial race will be a very interesting one to watch. b. so widely used that the testing industry can't keep up with demand. c. being challenged by the State of Connecticut. See here. Please pray that the world will get its act together to end this tragedy. For some, my identification of "You shall not bear false witness against your neighbor" as the eighth commandment will be a bit jarring. In Medieval times, a woman visited a monk. He was a man admired for giving holy, sensible advice. The woman realized, she said, that she had become a terrible gossip, the purveyor of hurtful words. What should she do? The monk told her to go through the village and bag all the goose feathers she found. Then, she should lay a feather at the doorstep of every person about whom she had gossiped. After that, she should return to the monk. UPDATE: Thanks to Bruce Armstrong at Ordinary Everyday Christian for once more linking to this series! ANOTHER UPDATE: Thanks also to Matt Brown of Good Brownie for mentioning this series. YET ANOTHER UPDATE: Best of the God Blogs has recommended this series, making special mention of this post and this one. Thanks so much! Each week, I share thoughts on the Bible lesson around which our weekend worship will be built. These comments reflect my study of the texts that week. Usually, the Bible lessons are taken from the lesson plan (lectionary) used by Lutheran churches. But occasionally, I diverge from the plan. At present, we're involved in a special Lenten emphasis, 40-Days to Servanthood. So, the texts during this forty-day period prior to Easter relate to that emphasis. I nonetheless hope that not just those from our congregation, but also others will find these notes helpful. (1) As we've said repeatedly here, context helps one understand content in interpreting Scripture. Just before the incident recounted here, Jesus predicts His own death and crucifixion. It's the third time that He's done so in Mark's Gospel and one would expect that the disciples would begin to "get it." But it turns out that the disciples are just as human and "thick" as I am, though. Coming on the heels of Jesus' encounter with the rich young man, whose dependence on wealth causes Jesus to tell him to sell everything he owns, give the proceeds to the poor, and to follow Jesus, Jesus' prediction strongly signals that His kingdom is different from the world's SOP (standard operating procedure). Power and wealth aren't to be seen or wielded in the same way in His kingdom as they are in the world. But, still believing that Jesus was planning on being an earthly king who would throw the Romans out of power and set up His own kingdom, James and John come to Jesus with a request that reflects very earthbound thinking. The disciples find it hard to see what Jesus is about or to follow Him with abandon. Not so the man who enters the main stage of Mark's Gospel after our lesson, providing us with more context. A blind man named Bartimaeus (the name means son of Timaeus, making the NRSV's appositional "son of Timaeus" sort of silly), insistently begs Jesus for healing. When he finally gains an audience with Jesus, Bartimaeus places his request before the Lord again. In a sentence that begins with Mark's favorite word, we're told, "Immediately he regained his sight and followed him [Jesus] on the way." (Mark 10:52) The former blind man sees what Jesus is about and follows Him with apparent abandon. (2) Our lesson finds Jesus on the brink of Palm Sunday, when He would be given a raucous welcome into the city of Jerusalem. The reason for the welcome, of course, was the widely-held assumption that Jesus would set up a kingdom that would throw off the oppression of the Romans and their local Vichy-style co-conspirators. The expectations of many who welcomed Jesus with cries of, "Hosanna!...Hosanna in the highest heaven!" were like those of James and John in our text. (Mark 11:1-11) Within a week of Palm Sunday, Jesus would be killed and on the following Sunday, the first Easter, rise from the dead. (3) At play in our text is a clash of ideas about God's identity and about how God uses power. To James and John, the exercise of power is expressed in two Greek words Jesus uses dismissively in our text: katakyrieuo (overlord or even lord against) and katexousiazo (use authority over or against). These reflect conventional notions of power. Under this scheme, power or authority is something that one exercises over or against others in a domineering way. It is not necessarily bad to be in a position of power and authority. Jesus certainly had that...there is a difference between having power and overpowering others. One who has power can act collaboratively with others. Those who lord it over others make others subordinate to themselves. This isn't Jesus' way. As commentator William Loader notes, "Mark is not presenting Jesus as wanting subservience. In fact he says so directly: 'The Son of Man did not come to be served. '...Being a servant and a slave is not about subservience to Jesus, but about joining him...Jesus' comments in 10:43-44, which almost mirror those in 9:35, declare that this is about what it means to be a person, what it means to be great. We have to add: in the eyes of Jesus and in the eyes of God..."
In other words, true greatness in God's kingdom is measured by the willingness to serve. Richard Cohen is a novelist and author of short stories. For more than a year now, he has also been a blogger. On his site, he writes what's called microfiction, stories that can range from the slightly fantastic to straightforward evocations of domestic life. He's been known to try his hand at parody as well. Richard sometimes steps from behind the curtain to speak in his own voice about life. I love his understated and beautiful way of writing. Over the past two days, Richard has presented two beautiful short pieces. See here and here. Reading Richard's stuff makes me realize that I may be a decent blogger, sometimes, a preacher, and an effective communicator. But Richard is that rarest of bloggers: Richard is a writer! Make Richard's writing a regular daily treat. Don’t overlook the service of small things. Richard Foster tells of being in graduate school, desperate to write his doctoral dissertation, when a friend from church called him. The man was without a car that day and needed to do some errands. Could Foster take him where he needed to go? With unspoken resentment, Foster agreed to help the man. Just before climbing into his car, he picked up his copy of Life Together, a book about Christian community written by Dietrich Bonhoeffer. With each new errand, Foster’s resentment at being forced to do these piddling tasks with his friend grew. When they came to a grocery store, Foster told the man he’d wait for him in the car. He pulled out Bonhoeffer’s book and read these words: “The second service that one should perform...is that of active helpfulness...simple assistance in trifling, external matters...Nobody is too good for the meanest service...” No service is trifling in the Kingdom of God! Stephen Douglas and Abraham Lincoln were lifelong rivals. They had courted the same woman; Lincoln won. They ran for the same US Senate seat; Douglas won. They both ran for President in 1860; Lincoln won. At Lincoln’s inauguration, a story, that may be apocryphal, says that there was an awkward moment when the new president didn’t know where to put his hat. Douglas stepped forward and told Lincoln that if he couldn’t be president, he could at least hold the president’s hat. Whether the story is true or not, never be afraid to be the person who holds someone’s hat. Don’t overlook the service of small things! Please pray for Hao Wu's release. Also, contact the Chinese embassy. Here's a link to it. Abdul Rahman, 41, was arrested last month after his family accused him of becoming a Christian, Judge Ansarullah Mawlavezada told Associated Press. The accused was charged with rejecting Islam. During the one-day hearing on Thursday, the defendant allegedly confessed to converting to Christianity 16 years ago while working as a medical aid worker for an international Christian group helping Afghan refugees in the Pakistani city of Peshawar, Judge Mawlavezada said. "We are not against any particular religion in the world. But in Afghanistan, this sort of thing is against the law," the judge said. "It is an attack on Islam." He will rule on the case within two months. Shariah law states that any Muslim who rejects Islam should be sentenced to death, according to Ahmad Fahim Hakim, deputy chairman of the state-sponsored Afghanistan Independent Human Rights Commission. Repeated attempts to impose a jail sentence were barred. Michael Reynolds stresses the point that this is the government we overthrew the Taliban to empower. Michelle Malkin stresses that Christians should be rushing to this Christian's defense. No doubt, but there's a much more universal issue here: freedom of conscience. To believe, or not, what you see fit. Not to compel, extort, enforce, or punish anyone else's belief. Today we call that a crime. It's no different from ethnic cleansing, it's just creedal cleansing. If you'd like to urge the government of Afghanistan to spared Mr. Rahman's life and allow for freedom of conscience in their country, the email address for the Afghan embassy is Info@embassyofafghanistan.org. I'm writing in regard to the situation of Abdul Rahman, a forty-one year old citizen of your country awaiting a potential death sentence for the crime of converting to Christianity sixteen years ago. It's appalling to me that at a time when Americans, many of them Christians, are risking their lives to give freedom to the people of Afghanistan, your government could accede to killing a man for exercising freedom of conscience. I ask you to employ your influence over the judge to insure that Mr. Rahman is not executed and to change the law under which he is accused. Please send your own emails on Mr. Rahman's behalf. The world is full of examples of people who live for themselves. Selfish living is the source of all the misery we see in the world and in ourselves. The quicker we learn that life is about the God Who designed us and wants what is best for us, and not about us, the more quickly we can serve in ways that are useful to God and also fulfilling to us. He goes on: “At first thought it would seem that hidden service is only for the sake of the person served. Such is not the case. Hidden, anonymous ministries affect even people who know nothing of them...It sends ripples of joy and celebration through any community” as others realize that are people who serve simply because it’s the right response to a giving God’s love. Strive to render service in hidden ways. Bible Passage to Ponder: “Servants, obey in all things your masters according to the flesh; not with eyeservice, as menpleasers; but in singleness of heart, fearing God” (Colossians 3:22, King James Version). My beloved Ohio State Buckeye men's basketball team lost to the Georgetown Hoyas in an NCAA Tournament game today. For a team that wasn't expected to do much as the season began, OSU's second-seed in the tournament and its Big Ten regular season-championship are both exceptional achievements. Thanks, Buckeyes, for a wonderful season! Imagine for a moment that you’re at a dinner with an important person. It could be President Bush or Senator Kerry, depending on your political preference. (Or maybe, Thad Matta or Terrence Dials.) Chances are that whether you were the host or another guest, with your special honoree present, you’d want everything about this dinner to go just right. But then imagine that someone you’ve never seen before--an anonymous woman--bursts in on your dinner party, breaks open a bottle of expensive ointment, and then, before anybody knows what to say or do, pours its contents onto the head of the important guest. What would you do? Call for security? Bodily toss the woman out of the place yourself? Start dabbing the honoree with your napkin? Apologize profusely? Of course, our Bible lesson for today recounts an incident similar to that imaginary scenario. It happened two days before the beginning of the Passover holiday period that would bring Jesus’ death. Jesus was eating at a dinner in the town of Bethany, being hosted by a man who was once leprous. All of the Biblical scholars presume--and I presume--that Jesus was surrounded by disciples, people who were His followers, a friendly crowd. Then it happens: This unknown woman walks in, uninvited. The type of flask she has in hand is designed to have its stem broken once. (After all there are no resealable containers in first-century Judea!) Once such a flask was broken, everything inside had to be used at one single moment. The ointment inside this particular flask is made from a perennial herb imported from India. Its aroma is so pungent that as soon as the woman breaks the bottle open, everyone in the house can smell it. Not only are the other guests overwhelmed by the beauty of the aroma, they also are taken by the extravagance of this woman’s action. The cost of one bottle of this ointment is the equivalent of a year’s wages for a day laborer. The woman proceeds to pour the contents of this ointment on Jesus’ head. We’re on the fifteenth day of our 40-Days to Servanthood here at Friendship. As we prepare for two-weeks in which our daily readings will consider the things that servants of God do, what can we learn from this woman and what she did for Jesus? My mother used to always tell me as I was growing up, “Mark, can’t never did a thing.” I’ve been trying to learn that lesson ever since. Through much of my life as a follower of Jesus, I’ve been an Excuse Christian, offering all sorts of excuses for why I can’t do this, can’t do that. The simple fact of the matter is that most of my “I can’t” statements are really “I won’t statements”: I won’t serve or seek justice for the poor, I won’t volunteer my time for a ministry of the Church or in the community, I won’t invite others to worship, I won't teach Sunday School. What will you and I do now for Jesus and in His service? Whatever it is, I guarantee that you and I can do a lot more than we think we can! Second: Servants honor Jesus. The Hebrew word Messiah and the Greek word Christ mean Anointed One. Old Testament prophecy said that an Anointed One, a Christ, would enter our world and would save all who believed in Him from sin and death. By her service, this woman was confessing her belief that Jesus was that Messiah. She was doing something else, Jesus says. In first-century Judean culture, whenever people died, the bodies weren't embalmed. They were anointed with spices, ointments, or perfumes. But when, a few days after this dinner, Jesus died on a cross, his death happened just before the sundown which began a sabbath day. (Remember that sabbath days, for Jews, run from sundown on Friday to sundown on Saturday.) Jesus’ body had to be buried before the sabbath started. Otherwise, those who handled it would be considered ritually unclean and so, unable to participate in the Passover. Jesus says here in our lesson that the woman who intrudes on the dinner in Bethany has prepared His body for burial even before He goes to the cross. Of course, the woman couldn’t have known that. She simply sought to honor Jesus. That should be our goal as well. Jesus tells us in the Gospel of Matthew, “Whatever you have done to the least of these... you have done for me.” When we serve others, we honor Jesus. Third: Servants don’t seek recognition for themselves. During the discussion at this past Wednesday’s Soup, Salad, and Servanthood gathering, I was reminded of the Friendship couple who, a few years ago, were at an upscale restaurant. They spied an elderly man dining alone. They told their waiter to bring the man’s check to them. They told the waiter: “If he asks who’s buying his dinner, just tell him that it’s someone who wants to share God’s love in a practical way.” They weren’t out to showcase themselves. It’s interesting that neither Mark or Matthew, who both tell the story of the woman who anoints Jesus in Bethany, mention her name. That’s appropriate because her name wasn’t important. What she did was important. She served not to point to herself, but to Jesus. As we seek to serve Jesus, we could do worse than to adopt the party-crashing woman of Bethany as our role model. that servants don’t seek recognition for themselves, but for the Savior Who offers forgiveness and everlasting life to all who surrender to Him and follow Him. Trial, error, and success are necessary steps in finding your unique brand of servanthood. While following Jesus Christ always means being part of Christ’s community of faith, the Church, God never intended for any two Christians to be exactly alike. Paul writes, “Now there are varieties of gifts, but the same Spirit; and there are varieties of services, but the same Lord; and there are varieties of activities, but it is the same God Who activates all of them in everyone” (First Corinthians 12:4-6). In several weeks, we’ll be introducing the people of our congregation to a process that will allow them to reflect on their spiritual gifts, intersts, talents, and experiences as a way of understanding the unique servanthood to which God calls them. That process will only make sense if people take a shot at various kinds of service. That’s where the process of trial, error, and success comes in. I admire the ministry of Habitat for Humanity. About a decade ago, I thought it would be a good idea for our congregation to become involved in its work of building homes for those who can’t afford getting housing by conventional means. I talked it up and one Saturday, a group of us met at a building site in a nearby community. For about a month, I accompanied some of the folks from our church as we joined others in constructing a house. My participation ended one Saturday though, when a considerate church member pulled me aside and said, “Mark, we all have our gifts. This doesn’t involve any of yours. I’m afraid that if you keep coming back here, you’re going to get yourself killed.” I had tried and it would have been an error for me to keep attempting to be a Habitat contractor. I had to keep trying until I found success in my own God-designed area of service.